By Aragon Garcia: Gervonta Davis and Hugo Ruiz met up on Thursday for the final press conference to discuss their fight this Saturday night on February 9 on SHOWTIME Championship Boxing at the Dignity Health Sports Park, formerly StubHub Center, in Carson, California. This fight has upset written all over it. “Tank hasn’t faced anyone with my kind of power. Don’t be surprised if I win,” Ruiz said to Fighthub. Hugo wasn’t given much preparation time for the Davis fight. He admits that he was given was given only 10 days to prepare for this fight. This could be a bad thing for a good thing. It’s 10 days for Ruiz, but it’s also a similar amount of time for Davis to prepare for him. Ruiz is 100% correct in him talking about Davis not having fought anyone with his kind of punching power for their fight LIVE on SHOWTIME Championship Boxing this Saturday night in Carson, California. This is a whole new ground that Davis is entering in facing a tremendous puncher with incredible size and speed like Ruiz. Davis has fought anyone like this during his short 6-year pro career. You have to question whether it was wise on Mayweather Promotions’ part to let their blue chip fighter take on such a dangerous puncher like Ruiz on one-weeks’ notice. Ruiz is not the type of fighter someone takes on in a weeks’ notice. That’s plain arrogance for Davis and his promoters at Mayweather Promotions to take on a knockout artist like Hugo Ruiz with just week of preparation. Gervonta was supposed to be fighting shopworn 33-year-old Abner Mares, who has a lot of miles on the odometer, and is coming off of a one-sided 12 round decision loss to Leo Santa Cruz. There wasn’t much for the 24-year-old Davis to worry about in fighting Abner, since he’s not a puncher, and he’s not been looking great lately. This match-up size-wise is similar to the fight last December between 5’2″ WBO super bantamweight champion Isaac Dogboe and the 5’7″ Emanuel Navarrete. Dogboe was supposed to win that fight, but Navarrette’s 5 inch height and punching power advantage was too much for him. Ruiz has the same kind of size advantage over Davis, but he also has the speed advantage as well. Ruiz started his career out at super flyweight [115 lbs] 13 years ago, and he’s spent a lot of time fighting at bantamweight [118 lbs] and super bantamweight [122 lbs]. Only recently did Ruiz move up to featherweight [126 lbs] for one fight before moving up to super featherweight for this Saturday’s match-up against Davis. Ruiz is still speed-wise a super bantamweight. That’s going to be a problem for Davis, because he’s been fighting a lot of slow guys like Jesus Andres Cuellar, Jose Pedraza, Francisco Fonseca and Liam Walsh. ”I can see a knockout of Gervonta Davis,” Hugo Ruiz said. ”No fighters are invincible. I think we’re ready to take care of Gervonta. The reason I have so many knockouts is because I really like to surprise my opponents, and I think I have something to surprise Gervonta with. On Saturday, we’ll see how many ways I can surprise Gervonta with. It’s a great opportunity with my career. I can’t let this opportunity pass me by,” Ruiz said. 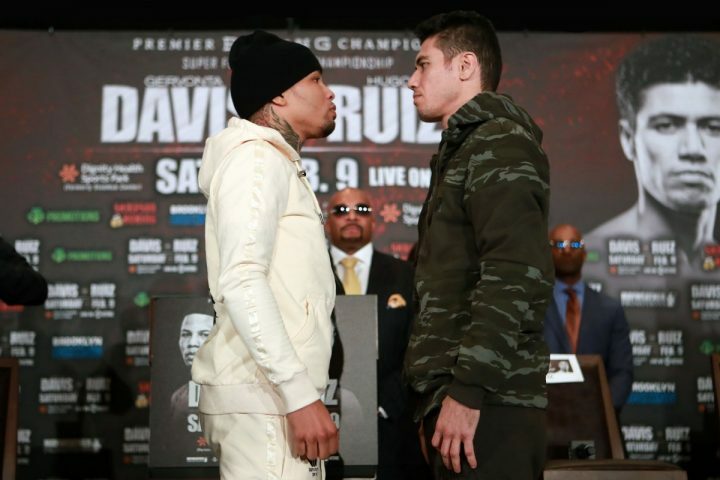 The 5’9 1/2″ Ruiz towered over the much shorter 5’5″ Gervonta when the two of the stood size by side for the face off. The size of Ruiz is gigantic next to Davis. Being four inches taller than your opponent at super featherweight is like being 10 inches taller than your opponent at heavyweight. It means a lot more to have a huge size advantage over your opponent in the smaller weight classes. Ruiz, 32, is even taller than 5’8″ WBA/WBC middleweight champion Saul Canelo Alvarez. Davis is going to have some problems trying to get in punching range against Ruiz (39-4, 33 KOs) without getting clipped by one of his longer punches The reason why Ruiz has so many knockouts is related directly to his size. He punches hard, but his height and reach makes his power even more devastating for the weight classes that Ruiz has been fighting at. There aren’t too many 5’9 1/2″ fighters at super bantamweight and featherweight. The ones that do possess that kind of size, aren’t huge punchers like Ruiz. Now that Ruiz has moved up to 130, he says he thinks his power is even better. If that’s the case, we’re going to have a competitive fight on Saturday night between the 24-year-old Davis and the 32-year-old Ruiz. There’s no way of knowing right now whether Ruiz’s power is better at 130 like he says it is, but in watching him hit the mitts of his trainer, he’s looking VERY powerful and incredibly quick, like a cat. Ruiz has got that cat-like quickness with his left hook and right cross. His trainer was wringing his hands after getting hit hard by Ruiz’s hard shots, You could tell that his trainer’s hands were hurting from some of Ruiz’s punches. If Davis gets hit by the shots that Ruiz was throwing with his mitt workout, he’s going to be in trouble on Saturday night. Ruiz suffered an injury that led to his ninth round stoppage loss to Hozumi Hasegawa in 2016. Ruiz might have won that fight if not for the injury. It was close on the scorecards at the time the fight was halted. The only other loss Ruiz has had in the last four years was against the hard hitting Julio Ceja in 2016. Ruiz was stopped in the fifth round. However, Ruiz came back immediately and knocked Ceja out in the first round in their rematch in February 2016. Ruiz couldn’t fight Hasegawa in a rematch though, because he retired from boxing after his win over Hugo. That would have been an interesting fight to see between them in a rematch. Haegawa was getting hit with monstrous shots from Ruiz the entire fight. It was one of those situations where Hasegawa would have had to walk through fire for him to make it through the last three rounds if not for Ruiz dropping out with an injury. There’s a very good chance that we could see an upset on Saturday night. Davis is fighting a guy that is superior in power, speed and size than anyone he’s faced before during his short career, and he’s taking the fight with little preparation. This fight has upset written all over it. Davis looked like he was asleep during the press conferences, and not fully aware of what he’s going to be dealing with on Saturday night when he gets inside the ring with Ruiz on SHOWTIME. There will be a lot of fans that will be watching this match-up. If Davis loses, he’s going to losing a lot of popularity with the boxing public. Ruiz has the experience advantage having been in with lions like Hasegawa, Ceja, Koki Kameda, and Julio Cesar Miranda. The experience and the training that Ruiz has done with top level fighters in Mexico. It’s priceless.